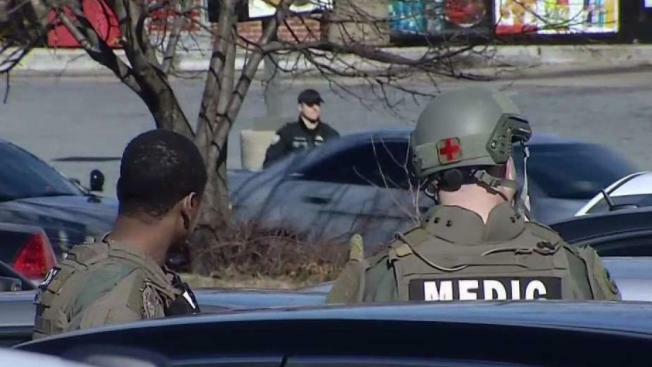 A man who barricaded himself inside a Capitol Heights, Maryland, hotel with his 6-year-old child is now in police custody, Prince George's County police say. Deputies with the sheriff's office were called to the Country Inn and Suites on Hampton Mall Drive North at 8:30 a.m. Friday after a couple got into a fight in the eating area of the hotel. "[He was] severely beating her - blood everywhere," one witness told News4. The woman was taken to a hospital with a broken arm and serious injuries, according to Prince George's County Police Chief Hank Stawinski. She is expected to be OK. A bystander who intervened was also injured, police said. The suspect retreated to a hotel room with his 6-year-old son, police said. Police do not know if he was armed. The Prince George's County Police Department was called to take over the investigation because of the equipment available to them. While securing the area, police told other hotel guests they had to leave. "I woke up to a police officer standing over my bed and he said get out, get your stuff. I'm in my pajamas," one woman said. "The officer came and he asked us to evacuate and so we did. We ended up going to the 7 Eleven to stay warm," said Wally Hernandez. Police negotiators were able to communicate with the man and convinced him to come out just before noon. The child is safe and has been reunited with his family.